Help to avoid a power outage, follow these power industry recommendations: 1. Set your thermostat at 68 degrees or lower in winter and at 78 degrees or higher in summer. (A 75-degree setting uses 18 percent more electricity and a 72-degree setting uses 39 percent more electricity. A 78 degree setting allows for sufficient cooling while still conserving electric power.) Consider installing a programmable thermostat so that you can have your furnace or air conditioning run only when you are at home. Most power is consumed by heating and cooling, so adjusting the temperature on your thermostat is the biggest energy conservation measure you can take. 2. Use an air conditioner only when you are home. If you want to cool down a room before you arrive home, set a timer to have it switch on no more than one-half hour before you arrive home. 3. Only use appliances with heavy electrical loads (dishwashers, washers, dryers) early in the morning or late at night. 4. Do not set the thermostat at a colder-than-normal setting when you turn on your air conditioner. It won't cool your home any faster and could result in unnecessary energy expenditure and expense. 5. Open draperies and shades on south-facing windows during the day in the winter to allow warm sunlight to enter your home. Close them at night to reduce the chill. Keep window coverings closed during the day in summer. 6. Clean or replace furnace and air-conditioner filters regularly. Dirty filters restrict airflow and increase energy use. 7. Clean warm-air registers, baseboard heaters, and radiators as needed; make sure they're not blocked by furniture, carpeting, or drapes. 8. Turn off lights, appliances and computers when not in use. Avoid using a "screen saver" on your computer monitor. Simply turn off the monitor when you won't be using the computer for a while. Set computers, monitors, printers, and copiers to their energy saving feature and turn them off in the evening. It's no longer true that computer equipment is damaged by turning it off and on. 9. Close windows when the heating or cooling system is on. 10. Caulk windows and doors to keep air from leaking, and replace old windows with new, energy-efficient windows. 11. Purchase energy-efficient appliances and lights. Look for the ENERGY STAR� labels. ENERGY STAR� is a program of the U.S. Department of Energy (DOE) and the Environmental Protection Agency (EPA) designed to help consumers identify energy-efficient appliances and products. 12. Minimize "leaking energy." Many TVs, VCRs, chargers, computer peripherals and other appliances use electricity even when switched "off." These "standby losses" can add up. 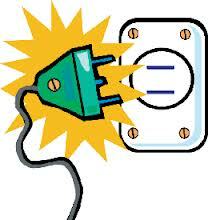 If possible, unplug electronic devices and chargers that have a block-shaped transformer on the plug when not in use. 13. Plug and seal the chimney flue if you never use your fireplace. Keep your fireplace damper closed unless a fire is going. Keeping the damper open is like keeping a 48-inch window open during the winter�it allows warm air to go right up the chimney. 14. Wrap the water heater with an insulation jacket, available at most building supplies retailers. 15. Wash only full loads of clothes and clean the dryer's lint trap after each use. Use the cold water setting on your clothes washer when you can. Using cold water reduces your washer's energy use by 75 percent. 16. Wash full loads of dishes in the dishwasher and use the "lite" cycle. If possible, use the "rinse only" cycle and turn off the "high temperature" rinse option. When the regular wash cycle is done, open the dishwasher door to allow the dishes to air dry. 17. Replace incandescent light bulbs with energy-efficient compact fluorescent lights. 18. Use one large light bulb rather than several smaller ones.